Since its advent in the early 1970s, bioethics has exploded, with practitioners’ thinking expressed not only in still-expanding scholarly venues but also in the gamut of popular media. Not surprisingly, bioethicists’ disputes are often linked with technological advances of relatively recent vintage, including organ transplantation and artificial-reproductive measures like preimplantation genetic diagnosis and prenatal genetic testing. It’s therefore tempting to figure that the only pertinent reflective sources are recent as well, extending back — glancingly at most — to Immanuel Kant’s groundbreaking 18th-century reflections on autonomy. Surely Plato, who perforce could not have tackled such issues, has nothing at all to contribute to current debates. This view is false — and dangerously so — because it deprives us of avenues and impetuses of reflection that are distinctive and could help us negotiate present quandaries. First, key topics in contemporary bioethics are richly addressed in Greek thought both within Plato’s corpus and through his critical engagement with Hippocratic medicine. This is so regarding the nature of the doctor-patient tie, medical professionalism, and medicine’s societal embedment, whose construction ineluctably concerns us all individually and as citizens irrespective of profession. Second, the most pressing bioethical topics — whatever their identity — ultimately grip us not on technological grounds but instead for their bearing on human flourishing (in Greek, eudaimonia). Surprisingly, this foundational plane is often not singled out in bioethical discussions, which regularly tend toward circumscription. The fundamental grip obtains either way, but its neglect as a conscious focus harms our prospects for existing in a way that is most thoughtful, accountable, and holistic. Again a look at Plato can help, for his handling of all salient topics shows fruitfully expansive contextualization. Regarding the doctor-patient tie, attempts to circumvent Scylla and Charybdis — extremes of paternalism and autonomy, both oppositional modes — are garnering significant bioethical attention. Dismayingly given the stakes, prominent attempts to reconceive the tie fail because they veer into paternalism, allegedly supplanted by autonomy’s growing preeminence in recent decades. If tweaking and reconfiguration of existing templates are insufficient, what sources not yet plumbed might offer fresh reference points for bioethical conversation? Prima facie, invoking Plato, staunch proponent of top-down autocracy in the Republic, looks misguided. In fact, however, the trajectory of his thought — Republic to Laws via the Statesman — provides a rare look at how this profound ancient philosopher came at once to recognize core human fallibility and to stare firmly at its implications without capitulating to pessimism about human aptitudes generally. Captivated no longer by the extravagant gifts of a few — philosophers of Kallipolis, the Republic’s ideal city — Plato comes to appreciate for the first time the intellectual and ethical aptitudes of ordinary citizens and nonphilosophical professionals. Human motivation occupies Plato in the Laws, his final dialogue. His unprecedented handling of it there and philosophical trajectory on the topic warrant our consideration. While the Republic shows Plato’s unvarnished confidence in philosophers to rule — indeed, even one would suffice (502b, 540d) — the Laws insists that human nature as such entails that no one could govern without succumbing to arrogance and injustice (713c). Even one with “adequate” theoretical understanding could not properly restrain himself should he come to be in charge: far from reliably promoting communal welfare as his paramount concern, he would be distracted by and cater to his own yearnings (875b). “Adequate” understanding is what we have at best, but only “genuine” apprehension — that of philosophers in the Republic, seen in the Laws as purely wishful — would assure incorruptibility. The Laws’ collaborative model of the optimal doctor-patient tie in Magnesia, that dialogue’s ideal city, is one striking outcome of Plato’s recognition that even the best among us are fallible in both insight and character. Shared human aptitudes enable reciprocal exchanges of logoi (rational accounts), with patients’ contributing as equal, even superior, partners concerning eudaimonia. This doctor-patient tie is firmly rooted in society at large, which means for Plato that there is close and unveiled continuity between medicine and human existence generally in values’ application. From a contemporary standpoint, the Laws suggests a fresh approach — one that Plato himself arrived at only by pressing past the Republic’s attachment to philosophers’ profound intellectual and values-edge, whose bioethical counterpart is a persistent investment in the same regarding physicians. 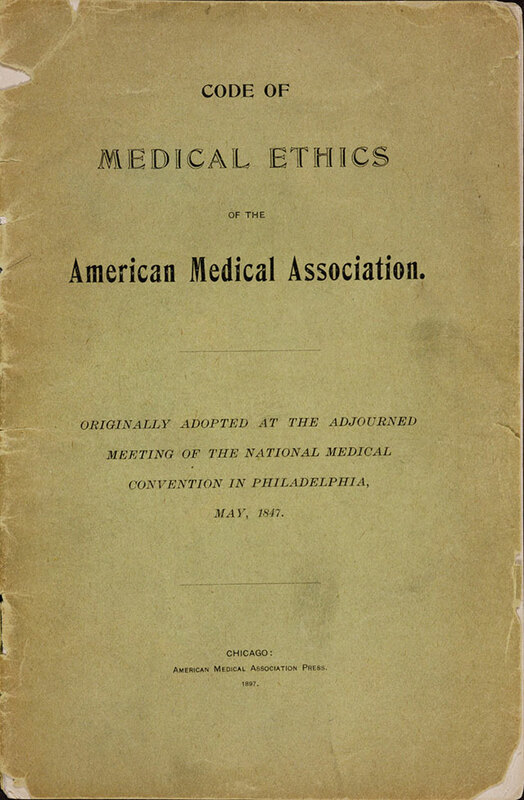 If values-spheres aren’t discrete, it’s unsurprising that medicine’s quest to demarcate medical from non-medical values, which extends back to the American Medical Association’s original Code of Medical Ethics (1847), has been combined with an inability to make it stick. In addition, a tension between the medical profession’s healing mission and associated virtues, on the one side, and other goods, particularly remuneration, on the other, is present already in that code. This conflict is now more overt, with rampancy foreseeable in financial incentives’ express provision to intensify or reduce care and to improve doctors’ behavior without concern for whether relevant qualities (e.g., self-restraint, courage) belong to practitioners themselves. Though medicine’s greater pecuniary occupation is far from an isolated event, the human import of it is great. Remuneration’s increasing use to shape doctors’ behavior is harmful not just because it sends the flawed message that health and remuneration are commensurable but for what it reveals more generally about our priorities. Plato’s nuanced account of goods (agatha), which does not orbit tangible items but covers whatever may be spoken of as good, may be helpful here, particularly its addressing of where and why goods are — or aren’t — cross-categorically translatable. Furthermore, if Plato is right that certain appetites, including that for financial gain, are by nature insatiable — as weakly susceptible to real fulfillment as the odds of filling a sieve or leaky jar are dim (Gorgias 493a-494a) — then even as we hope to make doctors more virtuous via pecuniary incentives, we may actually be promoting vice. Engagement with Plato supports our retreat from calibrated remuneration and greater devotion to sources of inspiration that occupy the same plane of good as the features of doctors we want to promote. If the goods at issue aren’t commensurable, then the core reward for right conduct and attitudes by doctors shouldn’t be monetary but something more in keeping with the tier of good reflected thereby, such as appreciative expressions visible to the community (a Platonic example is seats of honor at athletic games, Laws 881b). Of course, this directional shift shouldn’t be sprung on doctors and medical students in a vacuum. Instead, human values-education (paideia) must be devotedly and thoughtfully instilled in educational curricula from primary school on up. From this vantage point, Plato’s vision of paideia as a lifelong endeavor is worth a fresh look. As Plato rightly reminds us, professional and other endeavors transpire and gain their traction from their socio-political milieu: we belong first to human communities, with professions’ meaning and broader purposes rooted in that milieu. The guiding values and priorities of this human setting must be transparent and vigorously discussed by professionals and non-professionals alike, whose ability to weigh in is, as the Laws suggests, far more substantive than intra-professional standpoints usually acknowledge. This same line of thought, combined with Plato’s account of universal human fallibility, bears on the matter of medicine’s continued self-policing. Linda Emanuel claims that “professional associations — whether national, state or county, specialty, licensing, or accrediting — are the natural parties to articulate tangible standards for professional accountability. Almost by definition, there are no other entities that have such ability and extensive responsibility to be the guardians of health care values — for the medical profession and for society” (53-54). Further, accountability “procedures” may include “a moral disposition, with only an internal conscience for monitoring accountability” (54). On grounds above all of our fallibility, which is strongly operative both with and absent malice, the Laws foregrounds reciprocal oversight of all, including high officials, not just from within but across professional and sociopolitical roles; crucially, no one venue is the arbiter in all cases. Whatever the number of intra-medical umbrellas that house the profession’s oversight, transparency operates within circumscribed bounds at most, and medicine remains the source of the very standards to which practitioners — and “good” patients — will be held. Moreover, endorsing moral self-oversight here without undergirding pedagogical and aspirational structures is less likely to be effective than to hold constant or even amplify countervailing motivations. 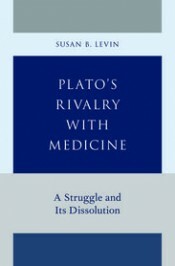 Susan B. Levin, Professor of Philosophy at Smith College, is the author of Plato’s Rivalry with Medicine: A Struggle and Its Dissolution. Her earlier writings include The Ancient Quarrel between Philosophy and Poetry Revisited: Plato and the Greek Literary Tradition (OUP, 2001) and numerous articles.